Former HBCU stars featured on huge day in the NBA. It’s a short list of HBCU players currently playing in the NBA and the two marquee names on the list will face one another on Christmas day. 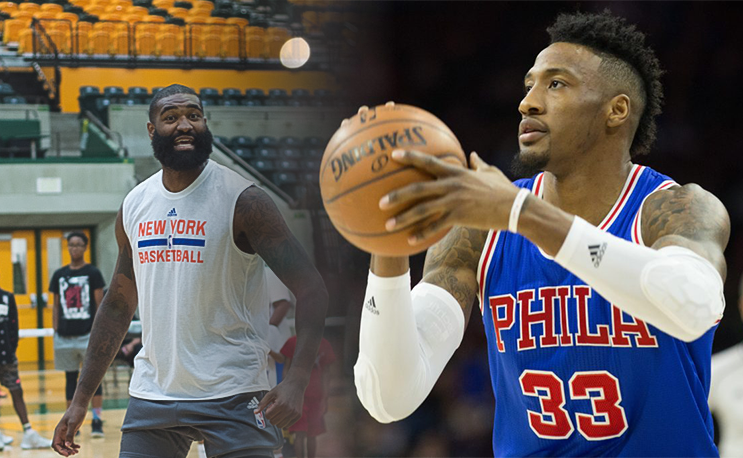 Kyle O’Quinn’s New York Knicks (17-15) and Robert Covington’s Philadelphia 76ers (14-18) will open up the NBA Christmas schedule at noon on Monday. The former Norfolk State and Tennessee State stars respectively, are also big contributors to their teams. Knicks forward Kyle O’Quinn hoops with kids at his alma mater, Norfolk State. O’Quinn the ex-Spartan isn’t taking over the scoring load from the departed Carmelo Anthony but he is a role player that provides energy and durability. He is one of only three Knicks to have played in every game ahead of Monday’s match-up. O’Quinn is also the third leading rebounder (5.9) and second leading shot blocker (1.09) on the team despite playing just 16 minutes per game. He’s averaging 6.4 points per game so far this season. If the playoffs were to start today the Knicks would be in as the eighth seed. New York hasn’t made it into the playoffs since the 2012-`13 season. Former TSU star Robert Covington has been lighting things up this year from behind the three point line in Philadelphia. He’s shooting 39.6 percent from downtown while averaging 14.8 points per game. How much of a weapon does that translate into? Covington is fifth in three point shots made per game in the NBA, behind two duos of sharp shooters from Golden State and Houston. The playoff prognosis for Philly isn’t quite as good at the present moment. They would not make it in if it started today. These two don’t play the same position and may never guard one another, but they are both north of 6’9″ so it’s not out of the equation. If a switch on a pick and roll happens and you happen to see Norfolk State guarding Tennessee State on a nationally televised NBA game, then consider that your Christmas gift.